We humans are many, but we are also one. Species, that is. For much of our evolutionary history, however, members of our family of ancestors, the hominins, trod the planet at the same time. Piecing together how and where these different species arose and lived from fragments of bone has always seemed an astonishing challenge to me. 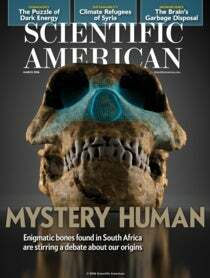 This issue's cover story, “Mystery Human,” by senior editor Kate Wong, explores a recent puzzle from a cache of enigmatic fossils found in a cave in South Africa outside Johannesburg, called Rising Star. The bones of a new species, Homo naledi, rested nearly 100 feet below the surface, in the “Dinaledi chamber.” The expedition to find them involved steep climbs and squeezing through passages as tight as eight inches across. In total, scientists have recovered more than 1,550 specimens from at least 15 individuals—so far. Tantalizingly, the bones combine primitive and more modern traits. Therein lies a series of provocative claims and debates about the relation of the new species to other ancient members of our human family, as well as what they might mean for H. naledi's behavior. For instance, H. naledi may have been intentionally disposing of its dead in the cave, a supposition backed up by the lack of sizable animal bones, which would suggest predators or other factors at work. Click here to begin a fascinating journey into our intriguing origins. With a mission to help foster the young researchers whose work will improve the world through the process we call science, the Google Science Fair opened for entries on February 17. Now in its sixth year, the annual competition is for students around the world ages 13 through 18; each entry can be by one student or up to three as a team. Scientific American is a founding partner, and I serve as the chief judge; other partners are Lego Education, National Geographic and Virgin Galactic. The Scientific American Innovator Award recognizes work in basic research topics, as well as the behavioral sciences, with a cash prize of $15,000 to be put toward the students' studies, a trip with a guardian on a Scientific American/Bright Horizons cruise, a year of mentorship to advance the winning work, and digital access to 170 years of Scientific American's archives for the winners' schools for one year. The submission deadline is May 17. The global finalists will travel to Google headquarters in Mountain View, Calif., for the awards event on September 27. Read about past winners at www.ScientificAmerican.com/education. For more, go to www.googlesciencefair.com.